Lt Smith stood in for Chief Deanda for this months Coffee with the Chief. Lt Smith statred off talking about National Night Out and the event was a success but they Lt. did talk about looking at how the event can combat decreasing attendance at the event. Sgt Brochard talked about current staffing. Sgr Brochard said that Rialto Police is fully staffed on the sworn and non sworn side of things. He also talked about how difficult it is to vet, train and hire new police staff. He also spoke to the high level of training our officers have. Cpl Russo spoke to traffic at rialto police. Last six months they have removed many DUI suspects from Rialto roads. The current OTS grant that the police department is using is $250,000. Right now the traffic department is fully staffed and they have added more training and now have new motor units to help reduce dangerous traffic situations. Cpl Russo said that they write tickets to stop people from making bad choices that eventually lead to traffic accidents. Cpl Russo and Lt Smith took questions from the audience about one dangerous intersection and they brainstomed possible solutions to the community concerns. Andy Carrzales asked about street light timing switching from one direction to another to reduce accidents from people pushing the light. Lt Smith said that they have pulled data on the Etiwanda Corridor due to their OTS grant and the Etiwanda improvement project. 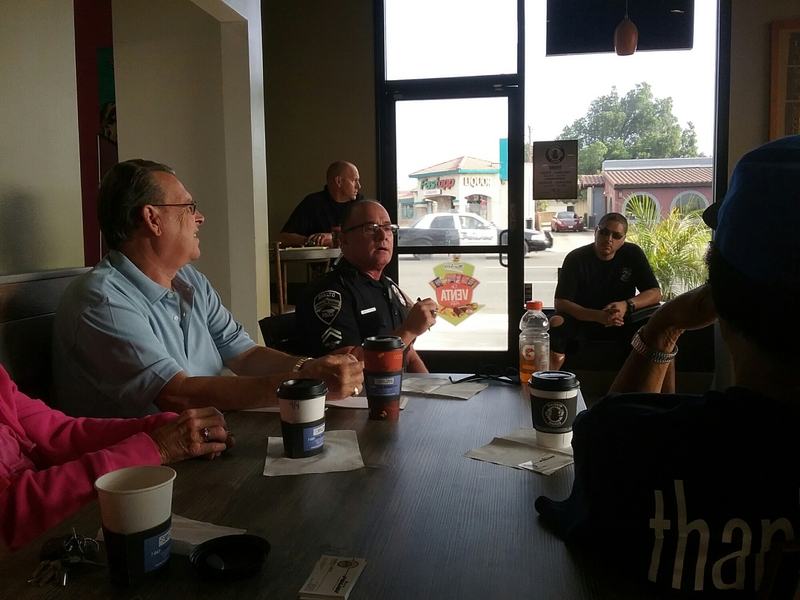 Next Citizens Academy will begin 9-27-16 thru 11-29-16 applications can be recived at the front counter of the Rialto Police Station or by emailing Lt Smith at rsmith@rialtopd.com Joe Britt said that the Rialto Police Citizens Academy is a great reasource for residents to meet the movers and shakers and learn about your police agency. Joe Britt also said the Police Deparment should package a training program for other agencies to be better prepared for using cameras in their agency. Lt smith said that large agencies have come to learn from Rialto Police Department but by in large what works for Rialto wont work for Los Angeles or New York. The Coffee event was a hit and well attended the dining area of the Coffee Nuttz was filled up and people overflowed into the Ice Cream section of the resturant. Good description of Coffee with the Chief.